Seaspray Australian Labradoodles is happy you came to visit. We breed the best puppies in the world - the Australian Labradoodle. Of course, we may be prejudiced! We are located in two areas of Florida - Tampa Bay west coast area on St. Pete Beach near Clearwater, Tarpon Springs, Hernando, Ft. Meyers, Naples, Miami, and central Florida near Ocala, Jacksonville, Orlando, Lakeland, West Palm Beach, Ft. Lauderdale, Miami, Lady Lake, The Villages and everywhere in between! We have puppies in Georgia, Alabama, Mississippi, Kentucky, Louisiana, South Carolina, North Carolina, Tennessee, Kentucky, Virginia, West Virginia, Missouri, Indiana, Illinois, Texas, Arizona, Missouri, Oregon, Colorado, California, as well as Germany, Japan, and Canada. We serve all states. We raise and love our puppies and dogs in our home with emphasis on Health Testing, Socialization, and providing YOU with an amazing new Labradoodle puppy of your dreams! We are here 24/7 to care for your new puppy - this is our ONLY job - and we love it! 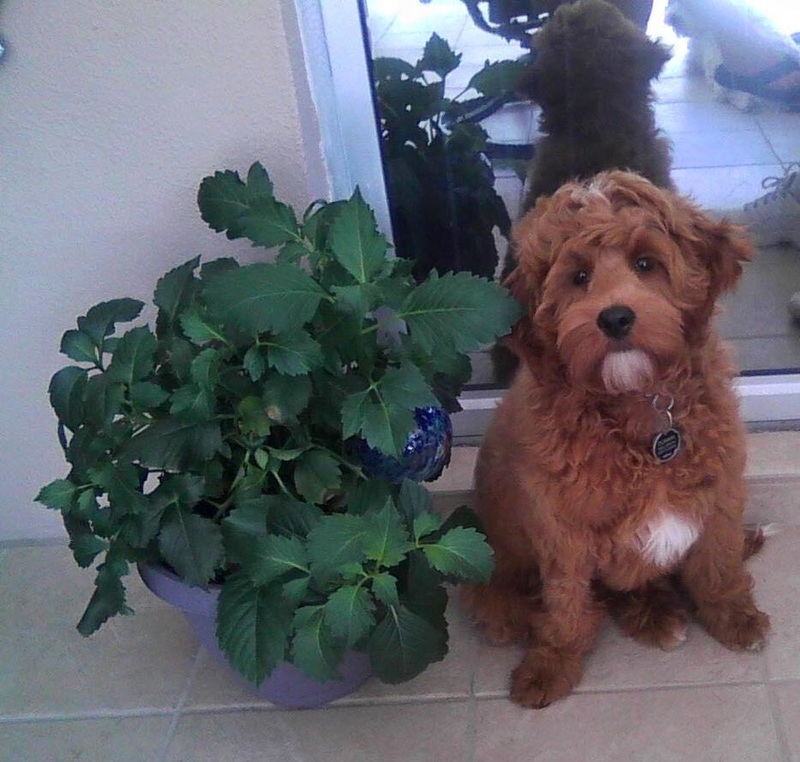 Let us introduce you to this amazing dog ~ the Australian Labradoodle and the Labradoodle Puppy! You will meet our dogs, and see picture albums of their current and past litters of Labradoodle puppies. Attending a "Doodle Day" is the best way to experience all the sizes, coat types, and colors. You will learn about the different coat types ~ extremely low or non shedding curly, wavy, or straight Fleece as well as Wool, which are the most Allergy and Asthma friendly type of coat. You will learn about "The Coat Change" ~ what it is, why it happens, and when it will happen. Sizes and colors of the Labradoodle.? You will find a complete explanation and pictures to help you. 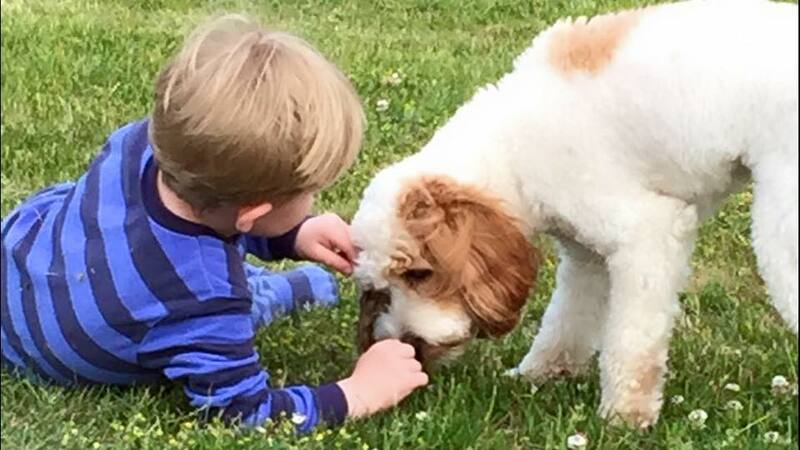 There is a great deal of information about our Seaspray Australian Labradoodles, as well as Training Tips, recommended products and services for your new puppy on our website. Find our Adoption Application, prices and payments under the "Application" tab. Our two year Health Guarantee under the information tab. There is a wealth of information waiting at your finger tips! We, at Seaspray Australian Labradoodles, look forward to talking to you by email and/or phone. See the "Contact" tab to reach Leslie or myself. 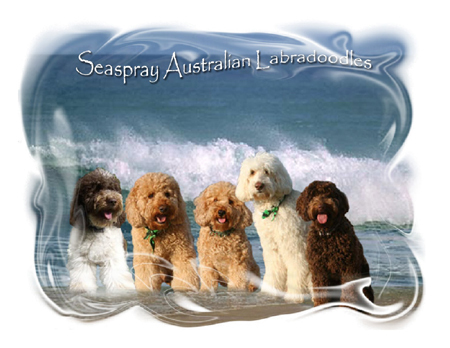 We love talking about and sharing our Seaspray Australian Labradoodles. Now, lets get busy learning about these amazing dogs and puppies - but BEWARE ~ they can be addictive! Seaspray Labradoodle Red and White Parti with his Best Friend.